So I have recently just upgraded my Wacom Intros Pro to the Cintiq 16. It all works great, apart from one problem. The screen doesn't work when two other monitors are plugged in. Originally I had 2 Dell ultrasharps plugged into the R9 270X Video Card, one through HDMI and the other through display port. Since the Cintiq needs the HDMI, I bought a HDMI - DVI cable and used that on one of the Dells. Both Monitors work great. 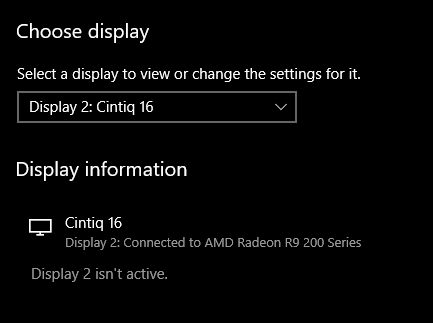 Now, if I plug the Cintiq into the machine with both the monitors plugged in, win10 doesn't detect it. If I unplug one of the monitors, the Cintiq works. If I plug it back in, then the Cintiq says "No signal. Going to power mode" and shuts down. The twist is that Windows KNOWS the Cintiq is there when the other monitors are plugged in. When i click on it all the "scale and layout" settings are grayed out, and the advanced display settings tells me "Display 2 isn't active". All the drivers are up to date, and I've looked online as well. I even found this article here that had a similar problem. However the turning it off and on again trick didn't seem to work, and I can't seem to access "AMD Catalyst" or even download it. I have the AMD Radeon settings installed, but every time I go to download the drivers for the card from the site, it's already the same update that I already have. Win10 device manager detects the Cintiq, but has all the screens listed as "Generic PnP Monitor". As I said, the Cintiq works absolutely fine when a second monitor isn't plugged in, but the fact this is an issue is driving me made. My machine specs can be found here if this is helpful. So looking at that, if i get a display port to display port cable, it should work? At the moment the Display port Dell is plugged into the HDMI - Display port. Sweet, I'll give it ago this evening, thanks! [SOLVED] Galax or Gigabyte 120gb ssd?